Shading is something I discovered around Episode Fifteen. Even the slightest gradiant in the background really makes the characters pop out. Sometimes I'll add a texture or blur during this stage as well. The text on your average strip consists of two or three fonts in 4 or 5 different sizes. Dialogue, unless meant to be screamed, is usually a 64-point One Stroke Script font while the header and footer is Cooper Black. More often than not, I'll alter dialogue from the script about now, second-guessing my joke or wondering if this particular character would really say what was originally scribed. Sound effects or creature sounds get a different font, sometimes highlighted in a different color. 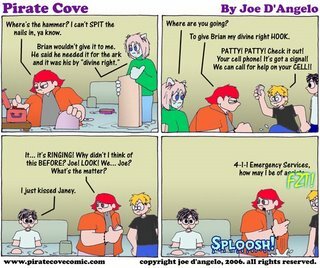 Highlighting dialogue is another thing I learned halfway through the course of Pirate Cove. Makes it MUCH easier to read words that intersect artwork lines! Last but not least comes the conversion stage. If I uploaded the final Bitmap to the Pirate Cove website, you'd be sitting there for 10 minutes, waiting for it to load. No, instead I convert the strips to a JPEG format, upload, and then update the comic strip with the finished product sometime between 11PM and 1AM Pacific time. And there ya have it! This is what I do for fun. Sounds like a blast, huh? Makes ya want to jump right in and create your own comic strip, doesn't it? Do you type the header and footer new every time or do you use a template?